The desire of a few local steam buffs to perpetuate the use of steam power necessitated the purchase of suitable land for an annual reunion. Twenty two acres (our present main show grounds) were purchased and hundreds of thorn apple trees cleared. A dam was built in Mud Creek to form Duck Lake as a source of water for th‍‍‍e engines. The group, then called La Porte County Threshermen, held their first show and reunion in 1957. Traction engines were the main feature and provided most of the power. A sawmill was added in 1959, the electric plant in 1961, and the Browning crane in 1962. At the suggestion of Bruce Achor, a couple of members purchased a steam locomotive in 1964 from Elliott Donnelley of Lake Forest, IL, who took an interest in the accomplishments at Hesston. With his generous financial assistance, during 1965-1968, the remainder of our 155 acre site was purchased and a unique dual gauge (24"/36") railroad was constructed. 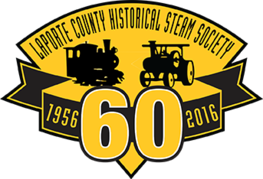 The La Porte County Historical Steam Society, Inc. was chartered as a not-for-profit organization on December 16, 1968 and the original La Porte County Threshermen club was absorbed and dissolved. In 1969, the IRS granted recognition as a 501(c)(3) not-for-profit corporation. Weekend (Memorial Day to Labor Day) operation of the railroad began in 1969. Additional buildings were erected and more equipment arrived for restoration and exhibit each year. The SHAY locomotive restoration was completed and dedicated August 30, 1975. Unfortunately, Mr. Donnelley passed away in late December 1975. His family donated the 14" gauge railroad that had operated on his Lake Forest estate, so it was removed from the estate by society members during 1976 and moved to the steam grounds. Construction on the new site started in 1977. Completion in July 1982 was marked with a Golden Spike ceremony. A $2.5 million fire on May 26, 1985 destroyed most of the large railroad equipment. Nine cars, the Henschel, and a diesel locomotive, along with many tools and small parts were lost. Also badly damaged were the Shay, Porter, and India locomotives. Members purchased two Plymouth gasoline locomotives, and along with a railroad coach that was purchased with a grant from the La Porte County Tourism and Convention Bureau, railroad operation (but not steam) resumed in time for the 1985 show. In early 1986, permission was received from the insurance company to begin salvage operations. The India locomotive was bulldozed out of the engine house rubble on March 13, 1986 and taken to the main shop for restoration. Just 89 days later it was back on the rails and under steam. The next day, construction started on two 24" gauge passenger cars. Dr. George Mohun of Novato, California contacted us, offering 4 locomotives and 8 flat cars, the remains of the Mecklenburg Pommersche Schmall Spurbahn Railroad in East Germany that was intended for a steam tourist railway near San Francisco. This railroad was never constructed and the equipment was stored on his ranch for 17 years. After an inspection trip, funds were borrowed and the equipment was purchased. The equipment arrived on April 14, 1987. The brand new, yet 47 years old, CSK was immediately placed in the shop for cleaning and inspection. It was fired up for the very first time in August 1987 and now serves as our regular locomotive for weekend operation. The India locomotive was retired in 1988, after a crack developed in the copper firebox, not quite making it to 100 years of operation. In 1990, the Orenstein & Koppel 0-8-0 was moved to the shop for a heavy restoration. In 1997, it was temporarily de-superheated and, in 1998, was reflued by the Hesston shop crew. Also in 1998, work started on construction of an enclosed passenger coach for the 24" line. In November 1998, two 36" gauge passenger coaches were purchased and transported from Cedar Point at Sandusky, OH. Ted was right. The museum saw completion of a new, beautiful, timber-framed, open depot / ticket booth for the 2007 season and the first “School Days” field trip. Since then, the volunteers and museum host one local school each year for a free field trip. During this time period, the advertising committee was put together and rebranded the museum as a quality, family-friendly, educational attraction. Doc’s Soda Fountain, complete with a 1930s soda bar and new modern restrooms, opened in time for the 2013 season opening. That improvement saw an overwhelming change in guest reactions. The improvements, branding, and community outreach have increased attendance and attracted more volunteers to staff the ever-growing events the museum puts on every year. The La Porte County Historical Steam Society is a group of people dedicated to restoring and preserving live steam equipment which played such an important part in the history of American life. While all have a common devotion and intent of purpose, the members of this group have a wide variety in their background, business or profession, and education. Each member is an important cog, but one member – the late ELLIOTT DONNELLEY – must be singled out as a strong spoke in our Society's wheel of development. Until his death in December 1975, he served as chairman of the Board of the Society from 1968 (when the Society was reorganized and reincorporated after absorbing the predecessor group, the La Porte County Threshermen which was incorporated in 1957). During his association with it, including while he served as president of the organization, his generosity to the Society knew few bounds. Additional land and buildings were purchased, buildings erected, the present length of dual gauge track was established, and locomotives and equipment were given to the Society by him with the knowledge that they would be faithfully maintained by members of the Society. Even after his death, the Society continued to benefit by the establishment of a Memorial Trust Fund provided for the Society by his will and by the donation from his wife Ann (with the blessings of their four sons) of his 14" gauge trains which had run at his home in Lake Forest, IL., often for the benefit of charitable and civic organizations. 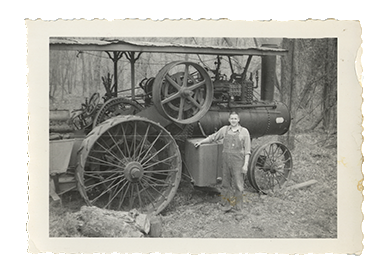 Founder of the LCHSS, he purchased the original 22 acres to have a place to operate his steam traction engine. Born March 13, 1924 in Benton Co., IN. He grew up in Michigan City, trailing his father, Louis A. Edris, through the NIPSCO powerhouse facilities, thus beginning a lifelong association with steam. First serving in the US Merchant marine in early WW II, he then joined the US Navy and served aboard the cruiser USS BOISE CL-11. After the war, he worked on SS North America, cruising the Great Lakes in the engine room of this classic steam passenger vessel. He served for several years as assistant chief engineer at the Indiana State Prison in Michigan City, and also worked for a time in the powerhouse at the Pullman Works in Michigan City. He managed the Long Beach Water Works for 10 years. Appointed by Elliot Donnelley in 1968 as General Manager of the society, he held that post until his death in 2005. Mr. John P. Edris, 81, of LaPorte, died Thursday, Sept. 29, 2005, at 1:15 p.m. at his home. He was born March 13, 1924, in Michigan City to Louis A. and Mary P. (Bedora) Edris. Mr. Edris retired as general manager of the Water Station in Long Beach. He was one of the founders and general manager of the Hesston Steam Society in Hesston. He was also one of the founders of the Great Lakes Museum of Military History in Michigan City. He was an active member of barbershop quartets in the area, Elks Lodge 432, New Buffalo Yacht Club, Moose Family Center 980 and American Legion Skwiat Post 451. He was a U.S. Navy veteran. On Nov. 28, 1953, in Michigan City, he married Amaryllis "Amy" Kassube. Also surviving are one sister, Geraldine Phillips of Trail Creek, and several nieces and nephews. He was preceded in death by one sister, Joan Nelson. The funeral was Monday at Root Funeral Home, Michigan City, with Rev. Lou Pasala officiating. Burial was in Greenwood Cemetery, Michigan City, with full military rites by American Legion Skwiat Post 451. Memorial contributions may be made to the LaPorte County Historical Steam Society Inc., 1155E CR-1000N, LaPorte, IN 46350.